Kings Cross has arguably some of the richest social history in the country. But it isn’t something that you often find people talking about and I suspect will recede as the area becomes more sanitised. The Kings Cross voices oral history project that ran a few years ago literally recorded some remarkable voices. I had thought that Voices had vanished online (the project had a bit of sticky end i think – no doubt someone will fill me in in the comments) but a random Google turned up some of the audio archive on the Camden Council website now playing properly, if a bit clunkily. 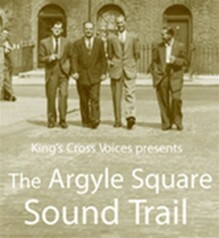 The sound files there of the Argyle Square Sound Trail are quite superb interviews with local people talking about the last 60 years of local history well worth a listen. It’s absolute gold – beats just about anything on iPlayer. If anyone has more material from this project in a cupboard please send it to me and I’ll put it online. There’s more local history stuff on our site and it’s well worth checking out this Kenneth Williams autobiographical film about his childhood in Kings Cross, where he talks about the same area (Cromer Street). This entry was posted in Kings Cross local history. Bookmark the permalink. I was amazed listening to Phil Daniels talking about growing up in Kings Cross as I remember myself most of what he talked about.Phil is 3 years older than me,but growing up as I did in Midhope buildings and going to the wonderful Argyle School the memories come flooding back.He mentioned Harry Sheehan the greengrocer who my late brother Paddy used to work for and I used to help as well as a tiny kid chopping the leaves off cauliflowers and shelling peas. Harry was a former British Army lightweight boxing champion.He was a realy kind man,but used to scare the wits out of me as every time my mum sent me over to buy some veg or some Sarsons vinegar there he would take great delight in lifting me upo by the ears which if you ever had that happen to you as a small boy know realy hurts ha ha. I went to Argyle school with his nephews Mark and Andrew Sheehan who i liked so much I named my my younger brother Mark Andrew after. Actualy Mark nearly got called Rajal Salaria after a brilliant Indian kid in my class who’s father owned a hotel near Lambs Conduit street. Rajal was a kid I will remember forever he was probably the most intelligent person I have ever met and could finish a board of sums quicker than I could finish 2 of the blighters. Rajal was also a very Camp kid.He would fight kids inm the playground ,like a girl slapping and scratching and clawing like a wild cat at their faces.He whilst not being particularly strong was well able to defenfd himself against bullies.I guess dear old Rajal was born gay,but we didn’t know anything about all that stuff in those tender years he was just a really great friend. Other kids I remember are Alfie Bennet a tall chubby kid who was a bit like a very young Arthur Mullard.He was obsessed with things to do with WW2 and had a Corgi dog called Churchill. Dennis Perdecue was another mate from those days who had a sister or cousin denise who i was secretly infactuated with. My late much missed brother Paddy used to run around with a local rogue called Kenny Yoxol and between them they always seemed to get themselves into trouble with the police. A mate of mine who lived in Bramber was Terry Jones who had and older brother Freddy (if I have remembered their names the right way around. My first six years were spent living in a flat on the 4th top floor of Midhope buildings next door to Albert and Elsie Dibble who had twin boys,Albert was a post man. in those days we didnt have a bathroom or a proper kitchen or hot water or inside toilet.The toilet was outside on the balcony and my dad used to boil water once a week and fill up our tin bath for our weekly baths of which all of us shared the water.Then in 1966 my younger brother Mark was born and we moved down to the modernised ground floor flat which was original number 51,but later was renumbered number 58. Before moving downstairs I recall their being built a communal bath house at the end of the yard in what had been the porters lodge,but once we lived downstairs if memory serves me right we had our own bathroom and hot water. Shopkeepers I remember are Browns the Newsagent in Cromer Street who me and my late much missed brother Paul both worked for doing paper rounds.Jones the Hardware store,Steven Lee what we thpought of as a supmarket in those days,but by today’s standard would be a convenience store.Jackson the grocer in Cromer Street who emigrated to Australia and his shop was bought by Asians who renamed the shop Kemp enterprises. Whjites the Butchers,There used to be Albert an old Barber who worked in a basement shop near to what used to be The Wellington pub,Bella’s groceries was another shop just on the corner of Tonbridge Street.She eventualy joined forces withn Kemp enterprises.Local people I recall by name are Jack McCracken and his son or Nephew Johnny French, Barnes the Chimney Sweep who was a real Victorian style chimney Sweep always covered in soot, when he retired he took to seeling new papers outside the Harrison Arms,Alan Slingsby who’s dad was a manager in a supermarket and ived in the rather posh Queen Alexandria mansions.I never met his dad,but by all accounts he wasnt a nice man. Alan who was my age and friend had a granny called Grace who lived in Midhope buildings opposite us.She used to visit my mum and dad and became rather dependant on them in her older age.Arnold Phelops was the dentist in Cromer Street,Keats Typewriters was the other side of the wall from where we lived.Dr Raynor a Scottish doctor was our GP during my childhood. Hello jim I lived in midhope around the same time as you. Guess you would remember my brother allan reading more than me. What a blast from the past kenny yoxall and little sister Beverly. The macrakens, frenches and do you remember the baseys? Charlie Jackson and wife urma. I never knew he went to Australia. We used to live opposite Elsie dibbles mum and dad first then they passed. Elsie had an older boy Colin before having the twins and her brother George married and also lived in the flats. We moved in 1970 to a tower block in Swiss cottage for a short while then to a place opposite the round house around 1973-74. Fantastic place to be at that time. I think i know who u r (as a little un that is) keep happy healthy and wealthy. Kim reading. Dear Kim I don’t recall you recall you by name,but for all my memories I have forgotten so many names we moved to Kentish Town in 1976. Hi Jim, its great to see these comments, this is Harry! My name is Harry King, not Sheehan, (Harry Sheehan is my brother-in-law). I owned the greengrocers with my wife, Pat. I am 73, well, and working as a taxi driver. Im not that old! Sorry to hear about Paddy, how old was he when he passed away? Hope you are well, it would be great to get a reply! Its great to hear from you I couldn’t believe it when that lady on facebook said you was still around and working as a taxi driver I am delighted that you are,and nowhere near as old as I imagined you might have been. Poor Paddy died in 2005 he was 53 he had gone to live in Ireland in 2000,and whilst there became ill with a debilitating back conditiion Spondylosis/spondylitis ?,and was in severe pain and put on heavy Morphine dosages in 2003 when I visited him with brother Mark who was visiting from Australia he told us he had had enough and didn’t think he would make it past Christmas,then in February 2005 I received a call telling me he had been found dead out in the garden of his house apparently dead from a heart attack my other half brother Paul died in 1988 he was in his early 30’s. I don’t know if my email will be accepted on this message board,but if you look at one any of my videos at my poetryreincarnations channel on the “About” page or you will see my hyperbolelad email address in the repeated copyrighted watermarking through the videos as they play I would love to make proper contact so we can share a few memories. Thank you for your reply. It would be lovely to hear more stories from the ‘good old days’. Pat & I moved to Essex about 12 years ago now, but still go to the Brunswick Centre on a Saturday morning for Breakfast in Carluccios. Pat still has her hair done in Marc one Hairdressers (do you remember him?). Not sure if you remember Andrew Sheehans older brother John he was good friends with Phil Daniels, well it was John who told us about this site and he’s daughter has seen the Facebook site too. John meets us in Carluccios on some Saturdays if he’s around that area (he’s a London Cabbie too). So if you are ever passing by on a Saturday from about 10.30 we could have a chat. We still see a few of our old Customers in the Brunswick so we usually have a catch up with them as well. Posted: Tue Nov 02, 2004 12:17 pm Post subject: WOW! Thanx for an amazing website Just a quick thankyou for putting together this fantastic website about one of my alltime comedy favourites.Kenneth Williams was an absolute genius how very sad it was that he came to such a tragicaly premature end I shall be a regular visitor here from hereon. Posted: Tue Nov 02, 2004 12:33 pm Post subject: Hi Jim, thanks for your kind comments. It is good that Kenneth Williams’ voices still resonate on film and radio, with BBC7 often repeating Round The Horne and Beyond Our Ken. Hopefully they’ll always be new fans discovering the delightful comedy that Kenneth gave us all. What’s your favourite KW film, by the way? Mine is Carry On Abroad! Posted: Tue Nov 02, 2004 7:09 pm Post subject: My favourite Carry on etc Thanx for the welcome I have just had been looking at Kenneth’s addresses which are of great interest to me as I grew up in Midhope buildings Cromer Street in Kings Cross where I lived from my birth in 1960 to 1976 when my dad moved us to Kentish town. My mum recalls seeing Kenneth out shopping in the locality many times. I was also a pupil of the wonderful Argyle primary school which Kenneth also attended many years before me. Its great watching the “Roots” documentary where Kenneth visits so many places that are equaly familiar to me. For instance the rooftop of Argyle school where as a tiny kid we used to play games. My half sister Brenda lived in Cromer house Kenneth’s childhood home. In the documentary Kenneth mentions that in his time peopl didnt have baths they had tin tubs stashed away on the balcony for the weekly wash. That was the case for me too until we moved from the 4th floor balcony of Midhope buildings to the downstairs newly numbered and refurbished flat of number 58 in 1966 on the birth of my brother Mark. We then had the great luxury of a our own toilet bath and hot and cold running water. The flat was still very damp being below ground level my dad got the rates reduced after getting the council to reclassify it as a sub – basement. I grew up looking at peoples legs passing our window,which as I reached my teens was something of a treat when short skirted ladies passed by ha ha. I had always heard that Kenneth had lived in Queen Alexandria mansions,but had never qiute knew if was true or not til reading the info on this excellent website. My mum reckoned my late and much missed brother Paul who was a rather theatrical type knew Kenneth. I and Paul who was a few years my senior used to deliver papers and had also helped the milkman with his deliveries during the sixties all around the area including Queen Alexandria mansions which I always remembered as being rather posh with its lovely art deco brass plated sliding lift gates and plush interiors. As kids me and my mates had loads of fun running around the balconies of those flats. In the documentary Kenneth stops outside the greengrocers he was called Harry Sheehan a realy lovely man an ex army boxing champion my older brother Paddy had helped him in the shop during the sixties. In the sixties we knew all the shopkeepers in Cromer street there was Brown’s the newsagent,Steven lee the little supermarket,There was Jones the hardware shop on the corner of Tonbridge street and Cromer street. Their was Jackson the grocer (a big jolly bearded man) who had a shop opposite Midhope buildings Jackson emigated to Australia in the mid to late sixties and some Asian people took over the shop under the name of Kemp enterprises a lady called Bella also had a nearby grocers shop on the opposite corner with Tonbridge street she was a big tubby very kindly lady who I recall lookeda bit like Hattie Jacques she eventualy sold up and joined forces with Kemp enterprises. Theres so much that realy rings a bell in me about Kenneth William’s humour theres an awful lot of Kings Cross in it. I dont think I ever met him (unless he passed me as a tiny child before I was old enough to know),but I always felt I knew him somehow,it must be our similar background growing up. Now Lastly my favourite Carry on with Kenneth (or without for that matter) is “Carry on Cowboy” Kenneth and Syd James are brilliant in it. Posted: Tue Nov 02, 2004 9:52 pm Post subject: What a wonderful connection, I found that very interesting. It is still quite a community based area from what I can tell, although Cromer Houses have been modernised to such an extent that it was very hard to identify them still as they have now painted over the Cromer Houses bit above the door-arch that leads to the courtyard. The area was resonant with the type of characters that Kenneth imbibed in his comedy, and I noticed how the streets all around the Cromer Street to Argyle St area were very narrow and close to one another, giving rise to a very close-knit community feeling. It was so nice that your mum noticed Kenneth about, he stayed within that area all of his life, with Argyle School being over the road from his flat in Queen Alexandria Mansions – which is a very big block. There’s also the Boot public house, which I am sure you recall fondly too. This is something that has changed inside since Kenneth’s day, but the outside is very recognisable from “Roots”. Have you been back to that area of late? I suspect that a lot do not realise that Kenneth Williams was such a famous son, but I can still sense his shadow walking round there to this day. Its great sharing a few memories of my life growing up around King Cross. As I mentioned previously my dad got us moved by the council in the hot summer of 1976 by then the floors in our flat were so rotten with damp my dad who was foreman of supplies at the Pearl Assurance in high Holborn had brought home loads of old sheet metal from filing cabinets to cover them. Brother Mark a very accomplished classical guitarist for his tender age was due to perform an evening concert at his school (Argyle school) a couple of hours before the event whilst he and I were sparring about as boys do he caught his finger in a door resulting in the tip flying off onto the ground. You cannot imagine how shocked and panicked I was. We rushed out of the door on our way to my brother Paddy’s flat (he lived in if I recall the name correctly Charrington house) As if by coincidence helped by act of God we bumped into Paddy as we were rushing over to him near the “Plum Pud Steps” at the side the flats he lived in.He took Mark to hospital and I rushed down to Argyle school to tell Miss Buchan (a lady of legendary kindness) the head mistress that Mark wouldnt be able to perform his concert. Marks teacher and musical mentor Mr Kenneth Young (the greatest teacher anyone could ever meet) had the onerous task of learning all the pieces Mark had been practising for weeks in 2 hours and performing the concert himself that night. It was this incident our brilliant dad used slightly modified in its actual train of events to shame Camden council into offering us a move,Which resulted in us moving to what seemed then the much cleaner environs of Kentish town. If I live to a hundred Kings Cross will always be in my blood and somewhere I have to make the occasional pilgramige to. In the Roots documentary Kenneth visited the premises his dad to used to runs his barber shop from and when the programme was made it had reverted back to being a pretty traditional gentlemans barbers. That shop has been used as several different types of shop in my lifetime in the early seventies it was for a few years a poodle parlour and pet food shop I used to buy pallets of a very red gellatine like dogmeat for my much missed darling labradour dalmation crossbreed dog Shep there. Talking of the “Boot” pub right next door to the Tonbridge club (run by the legendary Tom Hibbert who took us poor tiny kids on all sorts of fantastic camping trips and organised the youth club and Karate, my mum used to clean the club and Tom and his karate legend Miji Suzuki’s flats). A couple of years ago when my mum who now lives back in her native southern Ireland was over and we both had a walk down memory lane around Kings Cross and Bloomsbury,and we had a couple of pints in the Boot. Which has changed in layout since Kenneth was filmed there,but I daresay not that much in character. That was the first time I had ever been in that pub as I was still only a kid when I livec around the area. My mum who has always been fond of a pint knows it from a being a regular many years ago. When Kenneth describes his rather gruff dad ranting on about “Poofs” he reminds me a lot of my dad who had been on occasion unwittingly unkind about my late brother Paul who was gay and his sometimes rather colourful friends. My dad who admittedly always liked a good drink(but always remained god natured with it) was however for all his plain speaking gruffness a very kind man and not at all nasty unlike Kenneth’s father. My dad was just a man of his time I suppose who whilst retaining many old prejudices would never knowingly have hurt anybody and I will certainly never meet anybody kinder than him again. He died in 1991. Yes the Kings Cross of Kenneth William’s time is changing rapidly,but theres still an awfull lot there.Queen Alexandria mansions like everywhere these days has intercom door entry to the building so unlike in mt childhood you cant just walk in and wander about as us kids did often to the chagrine of the residents ha ha. Even Midhope buildings has been massively tarted up since my day (i wonder if they have got rid of the damp) and once again their are gates and intercoms where there used to be free access between the buildings. In about 1995 when the buildings were mostly occupied by semi-legal squatters the Italian artist squatter chap who was then living in my old flat of 58 let me in and I made a quick video of the flat to send my brother Mrk who now lives in Australia. I wax amazed how little had changed in nearly twenty years since we left. There was the same front door,the same old black box gas and electric meters. the same bathroom fittings and markings on the walls. The floors appeared to have been concreted so werent collapsing like in my day. For many years these buildings were going to be demolished until in the early eighties Prince Charles visited them and supported the local action group who saw the value in saving these historic dwellings and finaly in the late nineties they were properly fully refurbished. Last August of 2003 my brother Mark on his first trip back to London in ten years since emigrating to Australia had a wander around our old stomping ground of Kings Cross and was pleasantly surprised to see how nice Midhope buildings looks these days. He also had a very enjoyable trip to Argyle school where the head mistress was kind enough to show him around and update him on a few of his old friends who the school still knew about. Hi Jim, thanks again for that fascinating history of the area, it is good as it gave me a taste of the environment that Kenneth grew up in. It so coloured his humour, as you said, that I couldn’t imgaine him coming from anywhere else. Thanks also for giving me the history of Charlie Williams’s barber shop, this was somehing that I always have found interesting as Kenneth spent a good time living above the premises and often spoke about life in Marchmont Street. It is now a hairdressers again, this time under the name “CV”. Maybe they could give me a free trim for the plug! Thanx it was realy interesting reading about the brief history you gave of the East End Dwellings company.Blimey i’ve still got the old rent books which have “Hillview estate” printed on them. Eventualy Camden council took over the estate. Another remarkable/curious thing about the area is how the very poor (of which my family belonged) and the well to do lived in adjacent buildings. Midhope buildings backed onto a rather posh Art-Deco block of flats where Keats typewriters occupied the basement area and above their were smart flats. until at least the mid eighties it was possible to walk through via a door in the back wall of the yard of Midhope buildings as a short cut to Cromer street. Other notable characters I recall from my childhood in the area are. The local dentist Arnold Phelops in Cromer street he was a very chatty and likeable man,but seemed to me to be a bit of a ladies man as he’d get you seated in the dental chair and wander off and spend ages chatting to his dental nurses. You’d be wondering at times if he would ever come back ha ha. The family doctor we went to was Dr Raynor (in Cromer street) a rather dour Scot who could have walked straight out of the pages of Dr Finlays casebook. He was always slightly under the influence of strong spirits,one could smell it on his breath ha ha, but a darned good doctor still. I was a member of the local library since even before I could read (my older brother Paul used to frequent it as he was interested in musicals) which as a result of poor eyesight and my natural shyness finaly didnt happen till I was aged 8 by virtue of the fantastic Miss Freelander in the special reading class at Argyle school. I was the first one to leave the class and was awarded at the annual prizegiving ceremony with a large black plastic magnifying glass (which I’ve still got) which was one of the two gifts all us kids got given the other being a red hymm book. During my sixteen years living in Kings cross the library moved location several times. Firstly it was at the bottom of the sixties block of flats between Argyle square going towards Grays inn road(the conservative club was on the other side of the street) then it must have been in the late sixties the library was moved to Judd street junction with Marchmont street.then in the early seventies when the newly built Shaw Theatre complex opposite the more recently built new British library complex(built on the former British road services haulage depot) the library moved there. In the last 5 years the former Shaw theatre complex has been redeveloped into a big hotel and the Kings cross branch of Camden libraries has moved into the new annexe of Camden town hall. Across the road from Queen Alexandria mansions is a British Telecom buiding called Kelvin house. I worked there for slightly over six months in 1992 in “International directories” It remained an operator telephone exchange until BT closed all the London operator exchanges in late 1993. Kelvin house had apparently been a hospital prior to the G.P.O now BT turning it into a telephone exchange in the nineteen forties. Safeways at the “Brunswick centre” Judd Street was the first modern supermarket I recall seeing. The Brunswick complex was built in the late sixties/early seventies. Prior to that the biggest grocers shop in the area was the double shop fronted premises now occupied by the gay book shop “Gay’s the word” This was a very old fashioned traditional style mostly non self service style shop. Todays bookshop front (if they are still there I havent looked for yonks) is qiute similar to how the grocers looked (I think it was a branch of Steven Lee’s) Anyway this was where most folks seemed to do the bulk of their shopping in the area during the sixties and no doubt where Kenneth’s folks would have done theirs. The local street market for folks living in Kings Cross was and still is Chapel market at the top of Pentonville Rise, The Angel, Islington. Which is possibly the oldest street market in London (possibly Berwick Street market in Soho might be older) From Kings cross the 73 bus was the quickest way to Chapel streetmarket. Its been a marvelous week for fans of Kenneth Williams and Tony Hancock hasnt it with over 12 and a half hours of radio coverage to celebrate fifty years of Hancocks half hour etc. I was delighted to hear the clips of Kennetn discussing Hancock as well, Yes perhaps privately he was rather resentful of how Hancock had dropped him from his shows,but it realy didnt show in the interviews I’ve heard for the first time. I realy enjoyed Kenneth’s reading the poem “Lucky Jim” He certainly had an under exploited gift for reading poetry. As a reader and setter of classic and my own rather rare original poemds to music I a was pleasantly surprised to hear the energy he put into the reading. So often the big names who make recordings of their readings of poetry sem to be just going through the motions for the money,Kenneth obviously enjoyed doing the readings I would love to get a copy of his readings if anybody is able to make one for me. Yes, Hancock and Kenneth fans were very well served this week, excellent documentaries with many choice clips to illuminate the wonderful comedy that was Hancock’s Half Hour. Let us hope Round The Horne gets the same treatment on its 50th!! Luckily a lot of places Jim mentions are still there to see, I would like to have met some of those characters he writes about so vividly, especially Dr Raynor! Some Cine film I shot in 1974 of Kings Cross etc..